Connex Mercedes, a unique telematics system that keeps you connected to your Mercedes direct from your mobile app. That’s not all, Connex Mercedes also brings you Safety, Security and Connectivity giving you peace of mind, wherever your journey takes you. In case your vehicle is stolen, call our 24/7 Secure Operating Centre (SOC) to declare theft. Upon verification, our SOC will liaise with the Police for the recovery of your vehicle immediately. Accident Compensation up to RM3k towards your transport cost. Theft Compensation (recovery) up to RM5k for your repair bill. Theft Compensation (non-recovery) of RM30k (cash and credit). In case of an accident exceeding a preset Acceleration Severity Index (ASI) value, the system will automatically send an alert with the exact location of your vehicle to our SOC who will then direct emergency response services to you imediately. System warranty is valid for as long as the service is active. System is designed, engineered & manufactured by Meta System in Italy. Device homologation UN ECE R10-R&TTE. If your vehicle is hijacked or stolen, press the SOS button on your mobile app to call our SOC immediately. Upon verification, our SOC will liaise with the Police for their intervention and recovery of your vehicle immediately. In case of an accident, the system will automatically trigger an alert determined by the ASI threshold value. The system will send your vehicle's exact location to our SOC. Our SOC will then call you to verify the situation. However, if the call is not answered and the ASI threshold has exceeded, our SOC will liaise with MERS 999 to direct appropriate emergency response services to your vehicle's location immediately. You can activate Secure Mode to protect your vehicle with our Virtual Alarm. If your vehicle is started with Secure Mode activated, you will receive an alert. Check if your vehicle is safe. If theft is confirmed, call our SOC by pressing the SOS button to declare theft. Upon confirmation of vehicle theft, our SOC will immediately liaise with the Police for their intervention and recovery of your vehicle. In case of accident, compensation towards transport cost e.g. airfare, car rental, taxi fare and towing. In case of vehicle theft and if vehicle is RECOVERED within 72 hours, compensation towards vehicle repair bill. Sub-limit of RM2,000 for your transport cost. 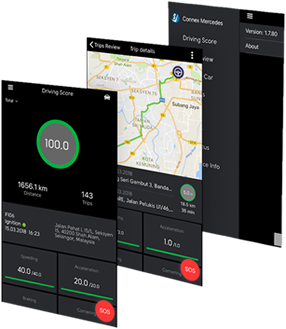 Use driving score to check your driving performance based on speeding, acceleration, braking & cornering. Press this button on your mobile app to call our SOC immediately in case of emergency e.g. your vehicle is hijacked or stolen. You may also use this button to call our customer service for general enquiries. Locate and track your vehicle in real-time on Google Maps. Check your vehicle status whether it is driving or parked, real-time traffic information and location of your smartphone with location of your vehicle. Check your previous trips to review your driving event. Unwanted trips can be deleted. Set your own speed limit to receive an alert when the vehicle's speed is exceeded. Set a virtual geographic boundary. If vehicle enters and exits the set boundary, you will receive an alert. Set your vehicle service due alert by mileage or date. Check the condition of your vehicle battery and replace if necessary. You can set up more than one vehicle fitted with Connex under the same mobile app account. Call CSE SOC at +603 5888 0000 to set this up.